What people don't know about gemstones is that they are just a bunch of colorful stones and rocks polished and precisely cut to be made into jewelries. Attractive as they seem, these stones are usually minerals dug out of the planet, others are tossed out. These gemstones posses certain characteristics that made them valuable to those who adore them. These crafted rocks go a long way. They have soft textures but majority are mostly hard. Lustrous ones are used for jewelry making. Some would address to these stones as semi-precious or precious. 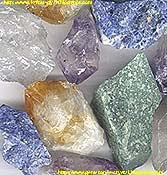 These stones are also used for therapeutic or aesthetic purposes. Mineral value would most likely depend on the rarity of the stone and how hard it is to find. The more exotic and difficult the area and location where the stone was found, the more expensive it is to purchase. Pebbles are also addressed as gemstones in some way. Some would come out big some just the right size. Gemologists are the ones who identify these stones. They have the authority to describe the minerals using terminologies that is within the scope of gemology. These people are the ones who give out certain gemstone characteristics and identify them according to their composition as chemicals. How are they characterized and what are their classifications? These stones may exhibit double refraction, luminescence and a particular spectrum that is distinct from other typical stones. Gems may have flaws that are presented as inclusions. Classifications may vary. They may be introduced as the cubic crystal system, trigonal crystal system and the mono-clinic crystal system. But the general approach for classifying is according to varieties, species and groups. The most valuable gemstone of all time is the diamond. Amounting up to millions of dollars, diamonds are priced based its properties which would be its brilliance and defiance. Unlike other gemstones, the diamond has its purpose. This magnificent yet available resource can cut through glass without being broken into tiny pieces. A gemstone's value is based on its characteristic and rarity. It all depends on how clarity is shown, the cut and phenomena to its optical reasons. Great demand in the market lessens the price of the gemstone unless situations may occur. Example, the diamond would be a need by millions, yet the supply offers only thousands. With this kind of situation, distributors can increase the price of the material. It is only when the stone is that scarce that people tend to adjust its value. But other than that, there are a wide variety of gemstones these days. Some are surprisingly cheap. To determine the value of a particular gemstone, water is used. Water is referred to as the combination of different colors and transparencies marked in gemstones. First water would pertain to the finest of all stones. Bye water would be the opposite of the latter. Some of the most precious stones are the emerald, ruby, opal and sapphire and are precious enough to reach such a surprising amount. Size also matters when predicting a price of a particular stone. In this era, gemstones are placed on a pedestal to be known as fashion material. Designers have used such stones to include in their piece of artwork thus making it priceless and elegant in such a manner.